Motion controlled floating menu dashboard system to be unveiled at E3? Xbox to get Minority Report style menu system? 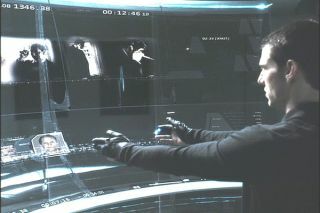 Those pre-E3 rumours pick up pace today, with the latest online chatter suggesting that Microsoft's much-rumoured motion control is going to be applied to the Xbox 360 dashboard, Minority Report style! Kotaku, a generally pretty reliable games news outlet, is the source of this latest rumour, claiming that they "know something big is in the works for the console's dashboard." The report adds that: "we're now hearing from a number of sources that the Live dashboard is going to be getting a second interface option, one that will use the yet-to-be announced motion controller to navigate." The report adds that the Xbox 360's new interface, "will recreate the increasingly cluttered dashboard "blade" system in a 3D environment that will be something more akin to the Minority Report than a filing cabinet." Sounds fantastic of course, as most pre-E3 rumours tend to. Let's hope we get some official confirmation and details from Microsoft at E3 later this month.